Occupational therapy isn’t limited to people who need to recover from an injury. It can also be used to keep people at a functional baseline. Everyone knows that the older we get, the less mobility we have. As a result, it is important to keep up communication with doctors as people age. Part of this discussion should include looking at short term occupational therapy. Despite the name being “occupational”, there is no job requirement or training needed to go to a professional. Instead, a general practitioner, like your family doctor, can refer you to one. To get assessed by your GP, you must have an exam at their office and discuss your pain points. After discussing what goals you would like to meet, your GP can send you a referral. The point of occupational therapy is to help people in all stages of life accomplish normal life tasks with reduced or no pain. This is the reason for the name “occupational” as it takes normal, daily activities during the therapy sessions. Occupational therapy practitioners are trained in a variety of techniques and are versed in the way your body comes together so they can treat you holistically. Occupational therapy can be useful for anyone who is dealing with disabilities, recovering from an injury, and people who need to combat muscle or bone deterioration. The goal of any occupational therapy intervention is to allow the patient to participate fully in their lives and chosen activities. It will not make someone a star athlete; however, it will help with the range of motion and any injury that had occurred during athletics. For Geriatric occupational therapy, the focus is less on recovering from injury and more regaining range of motion that is naturally lost as anyone ages. Therapy also can help older adults accept the cognitive and physical changes they are experiencing. The first thing that will happen during any therapy session will be an evaluation of your current range of motion, pain levels, and any specific areas that you want to work on. After that, you will discuss your desires for the future. This talk should be based on steps, milestones, and ultimately be realistic. In most cases, you will not begin actual therapy until after a session where everything is discussed. You will map out your treatment plan with your therapist. These treatment plans will almost always include homework for you to do daily at home. Depending on what your therapy goals are and how aggressive your treatment program is will dictate the intensity of your homework. 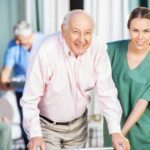 For example, a Geriatric Short Term Occupational Therapy Upper West Side NY may focus on a patient walking longer distances or increase the speed of their movement. What Benefits Can Short Term Occupational Therapy Provide? Short term therapy can provide a range of health benefits such as gaining back lost range of motion, helping ease the pain that comes with bone deterioration. One of the side benefits to short term occupational therapy is cognitive. Seeing progression can give patients a sense of self and agency that is imperative for their mental health.